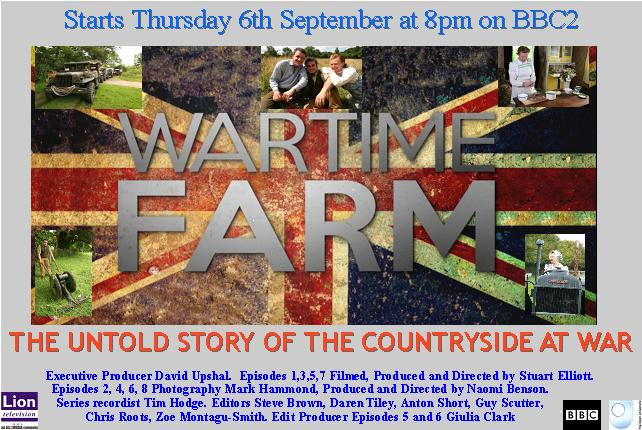 Next week sees the return of the next instalment of the BBC’s popular Victorian Farm and Edwardian Farm series. This time it is Wartime Farm. At least one episode feature Steve Mason, our CIO for Hampshire. Steve plays the part of an Intelligence Officer. The show also features scenes of Auxiliary Unit Re-enactors including Gerry Sutcliffe who has worked with CART a lot. In a new eight-part series, historian Ruth Goodman and archaeologists Alex Langlands and Peter Ginn take on their biggest challenge yet – to turn back the clock and run Manor Farm exactly as it would have been during the Second World War. They will face one of the biggest challenges ever seen in the history of the British countryside – what Churchill called ‘the frontline of freedom’. As well as tackling the trials of day to day living in volatile times, the team will be managing livestock, attempting to cultivate unused land, tackling new tools and technologies and learning the basics of civil defence, while all the time confronting shortages. The first episode finds the farmers in a new location, a new time period and with a new team member. There is a farmhouse to modernise, strict new rules to abide by and air raid precautions to contend with. The team begin by reclaiming land to grow new crops, whilst Peter works with a blacksmith to design a special ‘mole plough’ to help drain the waterlogged clay fields. Meanwhile Ruth and Alex get to grips with a troublesome wartime tractor – and must plough through the night to get the wheat crop sown in time. but their detailed knowledge of the landscape also made them ideal recruits for one of the war’s most secret organisations – the ‘Auxiliary Units’, a British resistance force trained to use guerrilla tactics against German invasion.